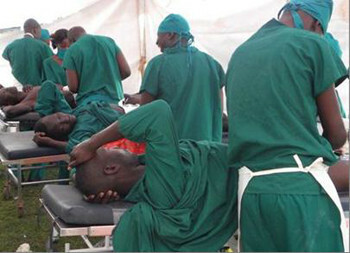 Following up the reports that Malawi24 released on 25 July that circumcision does not help in the reduction of HIV but exacerbates it, reports have emerged that have agreed with the facts that we had earlier established. Statistics cited by the BBC in a report marketing Medecins Sans Frontieres (MSF), one of the world’s renowned NGOs working on public health, show that HIV infection rate in Malawi has doubled in recent years despite a range of interventions put in place to tackle the spread of the virus that have included relentless campaign on condomisation and circumcision. According to the report, HIV rates have doubled in Malawi moving from 10% to 20% in 1 year. Strangely, this has been the same period that Malawians have been manipulatively forced to go through circumcision in masses with the promise that it reduces the contraction of HIV. The data published on BBC which revealed that of every 5 people, 1 person is HIV positive have pitted Malawi as the country worst hit by the HIV pandemic of all countries in the world. Commenting on the development some Malawians trashed the results claiming they were sensationalised and exaggerated for the sake of tarnishing the image of the country to the international world to achieve what they called MSF’s own hidden agenda. Others faulted the BBC, saying it was one of the broadcasters’ crusades against the African continent which they have tirelessly aimed to present in a negative light. This article has been updated. An earlier version credited the statistics cited by the BBC to MSF. However, MSF have denied that they gave the statistics to the BBC. The organisation says the claims the BBC made that 1 in every 5 people are HIV positive in Malawi were “grossly unfounded and sensationalised” with the aim of ‘grabbing headlines’. Malawi24 apologises for any inconveniences caused. It seems that nnow that circumcision is becoming rapily less popular in the US and the demand for infant foreskin is rapidly increasing they are seeking to create new harvesting areas for this very valuable comodity i.e (the infant prepuce.). Instiling fear of disease from those that ate not circumcisrd eil lead to a situation where the men that were misled into this mutilation will pass the curse onto their newborn sons and that is whrte the real money wil be ralised that is on the human tisue matket. Suonds crazy perhaps but a single foreskin taken from an infant can be turned into $100,000.00 US. THIS IS BIG MONEY.